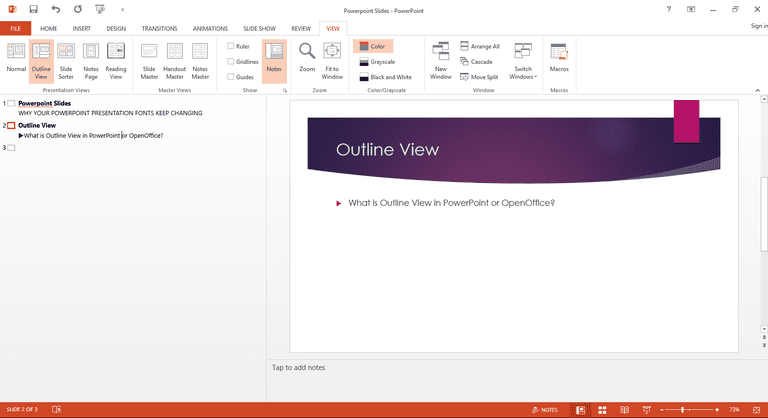 Outline View shows all the text of the slides in a presentation in PowerPoint or OpenOffice Impress. No graphics are shown in Outline View. This view is useful for editing purposes and can be printed for use as a summary handout. In Normal mode, click on the View tab on the ribbon. Click on Outline View to display an outline of the text in the Slides Pane. No graphics are shown. To print the outline, print as usual with one exception. Next to Layout in the print settings screen, select Outline from the drop-down menu. Make any other changes you want to the print settings and click Print to print the outline. Normal View is the view you use when you are working on your slides. 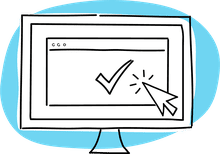 It includes the Slides Pane on the left of the screen, a large slide area and a section where you can write notes for the presentation at the bottom—a section you toggle on and off with the Notes tab at the bottom of the screen. This is where most of the editing of the slide happens. Access the Normal View from the View tab on the ribbon or by using the icon at the bottom of the PowerPoint screen. Slide Sorter View, which is also accessible from the View tab or at the bottom of the screen, arranges thumbnails of the slides horizontally. This view is useful when you want to rearrange the slides or view hidden slides. Notes Page View displays a reduced version of each slide and the presenter notes that were entered at the bottom of each slide. It is accessible from the View tab on the ribbon. You can print out the notes for the audience or for presenter-only use.